It failed in the drain of rice field (midsummer drainage), the rice plant fell, and it had a hard time in 2006. I decided to dig up the culvert to make easy to drain. I decided to make it during winter. Culvert is not visible in the basement there, Normal drainage ditch in the open ditch is visivle. 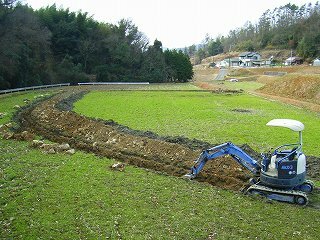 It dug up the rice field of my home as shown in the photograph and it dug up about 50cm a m in depth in width about 45m in length with the backhoe. The exit of the culvert water adjusted the depth of the point of the culvert to about 80cm by about 1.2m in depth, and, meanwhile, took a moderate inclination. The paved big stone went out originally and lying about went out when here was a river beach. It made a detour a little and it dug only there because a too big stone was not able to be dug out. It was work where being possible to shoot was not able to exist if there was no heavy equipment. It dug up how to dig up the culvert toward from the levee to the back as shown in this photograph. It doesn't widen it ..culvert.. too much across ..Caterpillar.. both sides of the culvert it because it has and it digs. It dug up the blade without using it in the place that had been dug once because the culvert came under the airframe this time though the blade was generally lowered to stabilize the airframe when digging up the soil. It put it far away by digging up the soil (topsoil) and using the arm of the backhoe fully as much as possible. It continuously dug up this by 45m. To do various work, the left side of the ditch is opened. Next, it dug up the soil in the under and it put it on immediately right side of the ditch. To carry it out previously, a big stone was put at the left of the ditch. It continuously dug up this by 45m. Starting during about two days (For about ten hours) in the work to here. It put it on the second and January 3, 2007. The Corrugate tube and VP for the culvert are arranged. In the first bottom in the culvert, it was a bellows pipe for the culvert of Φ75mm that opened a lot of small holes (Corrugate tube, S type, Φ75, L=30m) was put in about 40m(30m+10m) and the exit of water was the vinyl pipe of VU65 4m was connected. It bound to this connection in a stainless line of Φ1.4mm. 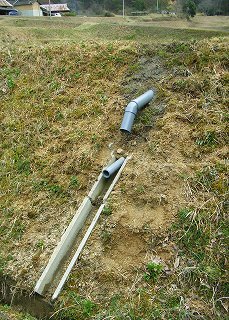 The cap for the point was installed on the point of the culvert tube. It took about three hours to arrange it while confirming the inclination of the culvert tube. The pipe for the culvert seems also to have the one that the unwoven cloth was rolled in the one that a small hole opened with not the bellows pipe but the hard vinyl pipe. A small stone that had dug one's way was displayed to surroundings of this pipe by the hand work, and the macadam of marketing (Balas) was put until the pipe disappeared. It took about three hours for this work. A lot of sand collected on the pond because of the vicinity was taken on this and it put it. The sand of the pond was dug by the backhoe, piled up, and the method of transporting sand was carried by transportation car where the carrier moved by the oil pressure like the dump truck. About five day hours were spent on work to carry sand. Next, it is turning on of sand. The thickness of sand is about 10-15cm. A part far from the road was carried by the backhoe and turned on though did a part near from the road by the hand work with a monocycle and a shovel. Because the labor was serious, you stopped it in a suitable point though you might put more. It took about five hours a day for this work. Skin of paddy is put instead of macadam and sand I think that it is not rots between many years, effective, and there a possibility of becoming it though there is a person who puts the stalk of the bamboo, the tree, and stalk of a thin, strong fernery, too. First of all, the soil of the dug pale brown (done hammer) in the under is returned. The soil was chiefly scooped without using the rejection soil board in the bucket, and because the soil on became obstructive if it pushed to this work by the blade, the soil was pulled forward and returned in the bucket. It worked by arranging the backhoe on the opposite side of the culvert with the soil while moving in parallel to the culvert. Moreover, a black soil (topsoil) on is returned. In this work, it worked by using the blade because it was only remaining topsoil. At this time, it is possible to work well by pushing the soil by advancement by using the blade to move a large amount of soil. 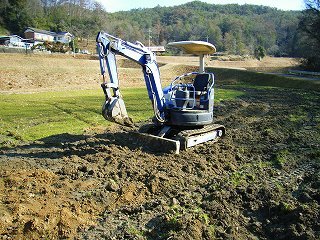 Moreover, the soil can be averaged, and it work efficiently by the backhoe's turning by using the side of the bucket even if the soil is pulled in the bucket of the backhoe. Using the blade goes well as a junior to flatten the soil at the end the use of the blade because of advancement. When it advances after it digs even for a moment too much when starting averaging by using the blade because of advancement, it hangs to the part up which Caterpillar dug, the front falls, and it becomes digging too much further. Reversely ..that.., Caterpillar hangs to the place where the soil is not dug this time, the front goes up, and it becomes shallower if it digs too much and it raises it a little ..[takara] and , blade... Will being to flatten it reversely becomes ruggedness. In this case, it goes well when the blade is used as a junior. It understands around here well when trying. It had a hard time a lot of big stones' that existed below coming out, collecting this, and throwing it away. The backhoe was greatly taken an active part to this work. It is very impossible in the hand work. The amount of the soil was not a lot and either became an amount that was not few but moderate because it had thrown away quite a lot of big stones. The time that had hung to the burial return was about five hours during a day. Because a small stone came out in the surface of rice field after having completed the culvert, a small stone was removed many times looking for. When the stone was picked up after the soil dried after rain, the stone seemed to look white easily. It took about five hours in total only in this work. There was no problem when trying though the tractor sank in the place in the culvert when doing with till a rice field coming tractor of the first age in which the culvert was made and it was heard that it did not move. The VU65 pipe with a thin center of this photograph is an exit of the culvert. To collect water in the rice field, the cap of the screw stop type is installed in this point with the paste of the vinyl chloride. Autumn- removes the cap for drain and the freeze proofing during the spring. 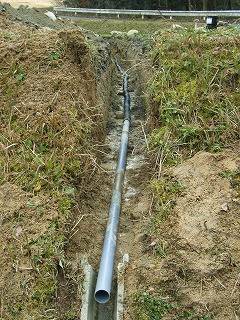 The culvert outlet under put the drainage trench of wearing out 15cm in width and prevented the soil from flowing. When the culvert was made, the overflow type outlet was newly made. The hard vinyl pipe of VU100 was used. It is a curved pipe in this photograph in 45 degrees on. This vinyl pipe is not bonded. It spent on these work for about five hours a day. Days and the time that had hung to current work became for about 40 o'clock the total about the eighth every the wife and 2 people. Because can wife and my work only on Sunday chiefly, and break time are excluded, a day is assumed for about five hours. It is likely not to serve as a reference so much. To make easily to understand, the cross section of the culvert for the rice field was made. The depth of the average of the culvert is about 1m. You might make the thickness of macadam and sand thicker though it was adjusted to 20-30cm. When the culvert is used, the depth of the culvert pipe thinks it should be shallow a little more. The omission of the water when the water of the culvert is pulled out is a little slow feeling. It is ineffectual at once to drain the rain water that falls on the surface early in the culvert. It seems not to be good if not still digging up the ditch on the surface of rice field. The labor is serious, and the wild boar buries the ditch up which it dug with great pains though neighbors seem to dig up ditch every year. Because you may collect water a little in me after it rains, it leaves to the culvert and it leaves just as it is.